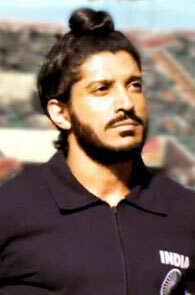 Farhan Akhtar's Bhaag Milkha Bhaag does not offer anything new, says Aseem Chhabra. Farhan Akhtar is a machine. Watching how he uses each muscle in his body -- on his neck, chest, arms, abdomen, legs -- as he runs in Rakeysh Omprakash Mehra’s Bhaag Milkha Bhaag, it is hard to believe that this father of two will turn 40 in exactly six months. I do not know what Milkha Singh sounded like in the 1950s, but Akhtar is totally believable as the eager, energetic, naïve, yet very committed runner in his early 20s who broke the national record for 400 metres, first represented India in the Melbourne Olympics in 1956, and won gold medals at the Asian and Commonwealth games. The sense we get from Mehra’s film is that Singh must have been a very likeable person -- or at least that is the myth that BMB creates. And Farhan Akhtar -- the director of Dil Chahta Hai, the refurbished Don franchise and the actor in his sister’s two successful films, Luck By Chance and Zindagi Na Milegee Dobara -- is very likeable as Singh, with a wide smile that shows all his teeth. If there is one reason to see BMB it is to watch Akhtar -- how much he has evolved as an actor and the sincerity with which he immerses himself in the character. It is very rare to see a Bollywood actor this committed to his/her role, to totally become someone else. And I truly believed that Akhtar was a Sikh, well, barring a few times when he slipped and sounded like his poet/writer father’s Mumbai-bred son. I wish I could find any other reason to recommend Mehra’s three-plus hour film that attempts to be an epic, but is really thin in plot and goes in so many different directions before it finally solves the so-called mystery: Why would Milkha Singh not run in Pakistan? It is a mystery to Jawaharlal Nehru (played in a very straightforward manner by Dilip Tahil), his advisers and even to one of Singh’s coaches. If there is one person who knows the answer to this big mystery, it is Guruji (Pavan Malhotra) who is Singh’s first coach. And so on a long train ride to Chandigarh, Guruji narrates Singh’s life to his companions and the audience. Milkha Singh was no doubt an inspiring figure, but the three hours that Guruji takes to walk us through the runner’s story -- and that too just 13 years of his life (the story of Singh starts around 1947 and ends by 1960, when he had turned 25), seems way too long. Even a vibrant performance by Akhtar cannot save a film that attempts to be an epic like Richard Attenborough’s Gandhi. But Milkha Singh’s life, eventful as it was, was nowhere as rich as that of Mahatma Gandhi. Mehra’s script writer -- the very talented lyricist Prasoon Joshi -- stuffs the film with segments that seem irrelevant and inconsequential to the larger story. In the three-hour period we are introduced to three women in Singh’s life (apart from his older sister played by Divya Dutta, who provides the film with all the right tear-jerking Bollywood moments) -- Nirmal Kaur (Sonam Kapoor), Stella (Rebecca Breeds) and Perizad (the Pakistani singer Meesha Shafi). Kapoor does bring a fresh sense to the film that starts to feel a bit heavy. But after two beautiful songs -- including Mera Yaar -- and a couple of other romantic scenes, she is gone from the film. It breaks Singh’s heart, but does it really impact the story and its big mystery? The same goes for the segment with Stella in Melbourne -- fun brief moments, including the catchy song Slow Motion Angreza, but it seems like we are being distracted from the film’s real purpose. By the time Shafi appears in the film and makes an attempt to seduce Singh, one has lost faith in the screenplay’s sense of narrating a story. I wonder what Shafi was doing in the film, or why she agreed to play such a tiny, unimportant role, after giving an equally unimpressive performance in Mira Nair’s The Reluctant Fundamentalist. I thought Bollywood was moving away from situations where songs or characters -- especially comic ones -- are forced into the script for the sake of keeping the audience engaged. Mehra showed a lot of astute touches in framing his narrative in Rang De Basanti and even in the partially flawed Delhi 6. But in BMB he falls back on the old ways of telling the story. There is an exceptionally funny moment in the film when Akhtar’s Singh freaks out during his first flight. And just when we least expect it, Mehra even introduces the relaxing Milkha Singh joke. Members of the audience of a certain generation will laugh-out-loud at the ultimate north Indian PJ! It is clear that Mehra and his team worked very hard to bring the story of Milkha Singh to the screen. There is a lot of research that went into BMB. Although BMB is no Chariots of Fire, the running sequences are quite gripping. But, despite the powerful background score by Shankar Ehsaan Loy, terrific cinematography by Binod Pradhan and some sharp editing by P S Bharathi, BMB feels like a laboured effort that takes too long to finish. A well-crafted BMB could have been a good companion piece to the intelligent and tight Paan Singh Tomar, or even a moving (albeit predictable) Chak De! India. The reason Singh does not want to run in Pakistan -- which was such a mystery to Nehru and his advisers in the film -- is obvious to the audience: the young Sikh had faced the traumas of Partition. In 1960, India and Pakistan were only 13 years old and the wounds of Partition had yet to heal. But we are living in 2013 and the depiction of the Partition violence in BMB looks dated. We have seen Partition scenes in so many films. And BMB does not offer anything new.